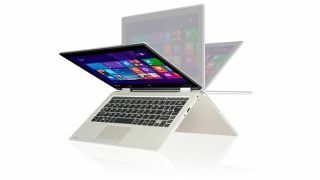 Toshiba has unveiled its first 11.6-inch convertible laptop, the Satellite Radius 11, which competes with the likes of the Lenovo Yoga 11. Tosh's latest offerings include the hinge-tastic Satellite Radius 11 which can be shifted into multiple form factors including laptop mode (duh) tablet mode, audience mode, presentation mode and tabletop mode. We reckon you'll use at most two of those, but the option is always nice. It's a Windows 8.1 PC, not unlike the aforementioned Yoga model and which weighs in at 1.3Kg with a 22mm profile. The baseline configuration include an Intel Pentium processor, an 11.6-inch touchscreen display with a 1,366 x 768 pixel resolution, a 500GB hard disk drive and up to 4GB of RAM. Pitched at the more cost friendly end of the market, the device wiill go on sale for as little as 399 Euros about £320, $520, AU$550).